Pixar has gone through various incarnations through the years. It started as a division of Lucasfilm in the late 1970s (they did computer-generated images for Star Trek II: the Wrath of Khan). As an independent company, Pixar sold computers that could be used to generate high-end graphics. By the early 1990s, the company would be focused on using its own computer imagery to entertain the masses. 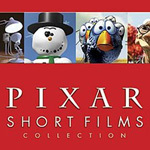 Its evolution can be seen in Pixar Short Films Collection - Volume 1. The DVD has 13 short films made by Pixar from 1984-2007, as well as some fun and informative bonus features. John Lasseter, a former Disney animator, was hired in the early 1980s so that the company could demonstrate the potential of computer-generated imagery. Their first film, The Adventures of Andre and Wally B. (1984), was made to be shown at a computer graphics convention. It’s 90 seconds of simple, cartoonish action — a large bee harasses a funny-looking man, who gets his revenge. Though it probably won’t be obvious to viewers, both characters are composed of basic, geometric shapes. The use of motion blur, and squashing and stretching makes their movements look more natural. Luxo Jr. (1986) features the antics of a small Luxo lamp and a ball, while its mommy, a regular size lamp, looks on. In Red’s Dream (1987), a unicycle dreams of success on the stage. What’s great about these early films is that the Pixar team is able to convey personality and emotions of inanimate objects through the use of movement and sound effects. The Oscar-winning Tin Toy (1988) uses the facial expressions of toys to great effect. It was this film that would provide the inspiration for Toy Story. By the early 1990s, Pixar had shifted its efforts to feature-length films. But even today it continues to make shorts that are shown in theaters before the feature presentation and on DVD as bonus features. Out of all of these shorts, the best are the theatrical ones, which tell stories with little or no dialogue, like Geri’s Game (1997), in which a crotchety old man plays a wild game of chess with himself. The made-for-video shorts feature characters from Pixar’s full-length movies. These are entertaining, though it helps to be familiar with the characters. All but one of the shorts (Jack Jack Attack) has a commentary track, usually by the directors. Some are more interesting than others. For the early films, Lasseter and computer programmers Eben Ostby and Bill Reeves talk about some of the technical innovations. The light and shadows generated by the lamps in Luxo Jr. presented a problem for Pixar’s techies. The commentary for Mike’s New Car (2002) is done by the young sons of the directors, who narrate the film with their own sound effects. Pixar Shorts: A Short History, (24 minutes long) covers Pixar’s work in the ’80s. Lasseter and Pixar’s computer graphics pioneers, such as Bill Reeves, Ed Catmull and Alvy Ray Smith are interviewed. Some of the information is repeated in the commentary tracks. The film gives a feel for the limitations of computers 20 years ago. They had to share computers and Lasseter often worked the late shift. Some video shot at the time shows a futon he kept under his desk. The DVD also has four shorts starring Luxo and Luxo Jr. that were made for Sesame Street. At 30-60 seconds, they are entertaining for all ages. Unfortunately, there is no “play all” option for these. Both the picture and sound vary according to the age of the film. The older ones, particularly the Sesame Street shorts, have noticeably worse resolution on a high-definition television. Everything from Red’s Dream on up looks and sounds excellent. Watch the shorts at your leisure. The 13 films only add up to an hour, so you might want to spread them out (and don’t forget the Luxo segments in the Bonus Features section). Check out the commentary tracks when you have some spare time and skip to the next film if you start feeling bored. Finally, watch Pixar Shorts: A Short History to fill in your knowledge of Pixar.